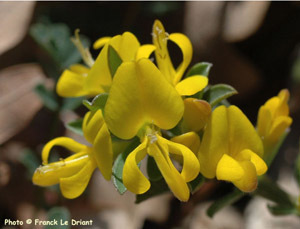 The genistas belong to the leguminosae genus and are widespread over southern Europe and western Asia in mainly dry rocky situations, but as usual there are a few exceptions. This is a truly prostrate species with fine dark green lance shaped leaves. In late spring it is covered in intense yellow flowers lasting 3 - 4 weeks. 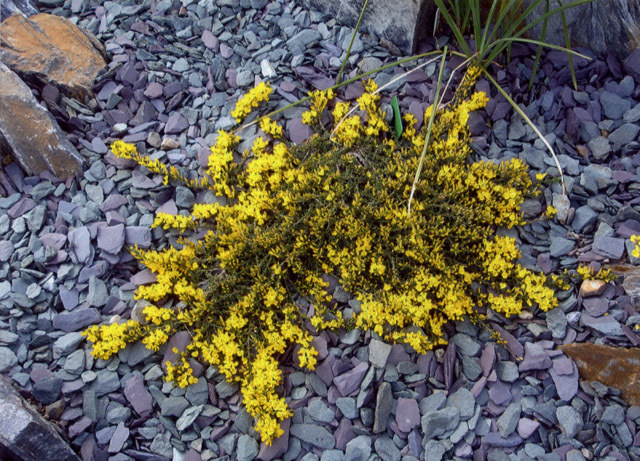 This plant lends itself for use in a large rockery or hanging over a wall; I use it on a flat surface of slate and it is very effective in breaking up a bland area. It appears to be hardy and slow growing, which is a plus in a rock garden. In my visits to other gardens in N. Ireland, Scotland and Wales, I have yet to see this plant used in Alpine Gardens (or the wise ones know better). Propagation is by cuttings in summer or seeds in autumn, but I suspect it may root itself in its present situation.